Mythimna separata, the northern armyworm, oriental armyworm or rice ear-cutting caterpillar, is a moth of the family Noctuidae. It is found in China, Japan, South-east Asia, India, eastern Australia, New Zealand, and some Pacific islands. It is one of the major pests of maize in Asia. The species was first described by Francis Walker in 1865. They term "armyworm" is used because of their habit to spread out in a line across a lawn or pasture, and slowly "march" forward, consuming the foliage they encounter. Plant volatiles released by corn plants may help the caterpillar avoid predators. The wingspan is 35–50 mm. Males lack paired tufts on the basal segment of the abdomen below. The forewings are greyish yellow with a dark-grey or reddish-yellow tinge. The round and reniform spots are light or yellowish with indistinct edges, whereas reniform spot with white point at lower margin. External wing margin blackened obliquely from top backward, with dark stroke and with a row of dark points. Hindwings are grey, with dark external margin. Antennae thread like. Eggs are spherical and milky white with a thinly reticulate surface. Larvae usually have six instars, rarely seven. It reaching 40 mm in length at its last instar. Larva has two wide black-brown and one intermediate light dorsal stripe, with black-brown lateral stripe along spiracle line. spiracles brown with black rim. Pupae are yellowish brown and shiny. The moth flies from January to April depending on the location. 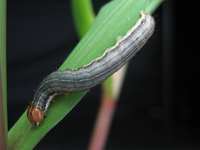 The larvae feed on a range of agricultural plants like Zea mays, Sorghum bicolor and Oryza sativa and are thus considered a pest. Caterpillars do not feed on Momordica charantia due to the presence of the triterpenoid glucoside called momordicine II, which is a natural inhibitor of caterpillar actions. Larva can be hand picked and adults can attracted using pheromones. Regulation of water level in the fields, and removal of alternate hosts from the field are also effective. Among biological controls, ducks are good; they can locate larvae hiding in the soil or at the base of plants easily and prey on them. Introduction of Cotesia ruficrus, and Eupteromalus parnarae also parasitized the larva. Selective pesticides and weedicides can also used in the field. Integrated pest management methods undertaken by governments. ^ Thakur, J. N.; Rawat, U. S.; Pawar, A. D. (1987). "First Record of Armyworm, Mythimna separata (Haworth) as a serious pest of maize in Kullu (HP) India and recommendations for its integrated management". Tropical Pest Management. 33 (2): 173–175. doi:10.1080/09670878709371141. ^ Hampson, G. F. (1896). The Fauna of British India, Including Ceylon and Burma. Moths Volume IV. Taylor and Francis – via Biodiversity Heritage Library. ^ "Pests-Oriental Armyworm". Interactive Agricultural Ecological Atlas of Russia and Neighboring Countries. Retrieved 4 August 2016. ^ "Mythimna (Pseudaletia) separata (Walker)". ICAR-National Bureau of Agricultural Insect Resources. Retrieved 4 August 2016. ^ Herbison-Evans, Don & Crossley, Stella (1 December 2012). "Mythimna separata (Walker, 1865) Oriental Armyworm". Australian Caterpillars and their Butterflies and Moths. Retrieved 23 July 2018. ^ Wang GP, et al. The role of nectar plants in severe outbreaks of armyworm Mythimna separata (Lepidoptera: Noctuidae) in China. Bulletin of Entomological Research 2006 October 96(5):445-55. ^ Staff, ChinaDaily. 14 August 2012. "China warns of armyworm outbreak"
^ "Paddy armyworm (Mythimna separata)". Plantwise Technical Factsheet. Retrieved 4 August 2016. Wikimedia Commons has media related to Mythimna separata. This Mythimnini-related article is a stub. You can help Wikipedia by expanding it. This page was last edited on 6 January 2019, at 17:55 (UTC).